Do you have a classical bullet point text slide with a list of items while making your presentation? You can easily change it to simple infographics slides and make your presentation more understandable and attractive to customers. 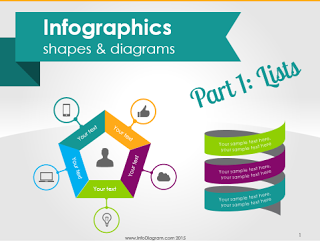 You can see and get the source Infographics Shapes and Diagrams PowerPoint slides from our webpage. PS. I wonder what’s your common problem when working with text slides – let me know in comments or write me directly via the Contact page. I will be glad to suggest you some visualization ideas.